I love summer, this year the beautiful outside weather has pulled me away from indoor activities especially my craft room. In addition I have a calendar of all the cards I need to make throughout the year and unfortunately it was lost when I build us a new computer. I think I have missed a few birthdays, maybe an anniversary or two as well. For all those who may read my blog and are usually a recipient of a card and have not received one, I am very sorry. I am canvassing for dates I may have lost. I have not made more than a card or two in the past month, I know I need too and every time I try to sit down and cut a little card stock the sun calls to me, what I really need is a storm day (shhh) I guess I should not say that too loudly and lose our glorious summer we have been having. I think this is the cutest card, I used a thank you card from my Stamp'in Up! Rep as a template, then added my own touches. 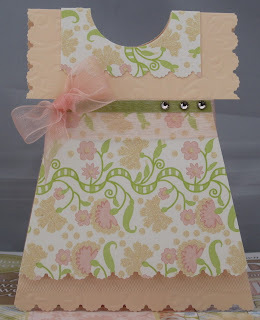 Supplies: Peach cardstock, Designer paper-Nan's Nursery Baby Girl, cream tulle, pink ribbon, misc gems, Spellbinders Impressabilities-Butterfly and EK Success-Scalloped Scallop Edger Punch. I have been a bad blogger, time seems to be zooming on by so far this summer. The multi-page card was well received and looked good when it was all put together. I will post that in a few days, I needed to post something different to remind myself I know how to card make. My last few attempts did not make me happy. This was a pretty simple card, the tag is 2-D as is the flowers. The flowers bottom layer is Designer paper then I added edges of glitter to the top level of green paper to try to tie it in with the beautiful My Mind's Eye paper. Supplies: Cream and green cardstock, Designer paper-My Mind's Eye-Laundry Line, Close to My Heart-Tender tags, Sizzex Die-cut Flower #4. Misc Gem and Collections Pearl brad. So this is it, this is the back of the card. I have not been asked to make any more 'pages' so I should be able to bind the card early next week if all goes well. I tried to bring all the pages in for the last page with the small squares. 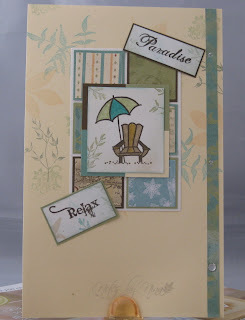 Supplies: Designer Paper-Close to my Heart –Veranda, Stampin’ Up!-Naturals White cardstock, Memory Box- Leafy Branch, Comotion Rubber Stamps-Leaf Spray, Perfectly Clear Stamps-Fun in the Sun, TPC Studio - Spring Break, Making Memories-square eyelet.